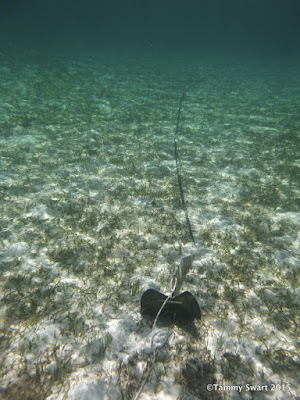 We left Tom Curry Point near Little Harbor, Great Abaco early in the morning. We weren't really ready... I'm not sure why we just pulled up the anchor and took off... But we were going offshore coastal knowing that there would be some seas, without making sandwiches for lunch or even having breakfast!!! We put the cats into their carriers so that they would be out of the way for the first part of the journey when the waves would be the worst. Getting going is always the worst. When we get the sails up things usually smooth out a bit. But not so much today. After raising sails and getting us turned towards our course, Bruce made the mistake of spending too much time down below. He came up looking pale and was about as close to being seasick as I've ever seen him. We spent the next three hours riding the wind and waves southward along the east coast of Great Abaco. I wondered what would happen if I got queasy... you know how it is. If you think about it, you'll be seasick... So I focused on NOT thinking about it by thinking instead about how this sail really was pretty nice. We were leaping along with only the occasional big wave making us lurch a bit. But it was really a beautiful day and perfect winds for our big girl. We cruised on down the coast... Bruce's color returned with a bit of hydration and a chance to sit on the rail in the shade. We enjoyed the Hole-In-The-Wall Lighthouse as few people ever see it. It was built in 1836 and is one of the oldest lighthouses in the Bahamas. All too soon we were looking at the shoal that marked our anchorage. 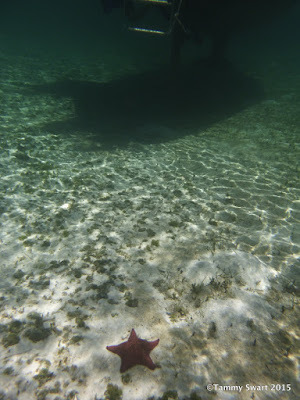 The water was gorgeous and glowing as we dropped sails and motored up to find a spot in about 9 feet of water so clear you could see the dozens of Bahama Starfish lying below the boat. We enjoyed the sunset and relaxed as we marveled at how lucky we are to be in this place. The next day we never left the boat. That's the luxury we enjoy as Cruisers... we get to do what we want. Bruce took care of some maintenance things around the boat, while I did some computer stuff. I found several open wi-fi signals and was able to piece together enough internet to get some blogging and posting done to our page, as well as to search out some solutions to some MacBook issues we've been having. I spent most of the day on the computer but I got a lot done. Sooooo I guess we're staying another day! We were up-and-at-'em early the next morning getting our morning chores done. Going ashore means we gather trash and batten down the hatches in case it rains while we're gone. We took off with our water jugs in hope of obtaining some water while we're here. We parked the dinghy next to the government dock and secured it in readiness for the changing tide with the stern anchor out. This keeps the dinghy from drifting beneath the dock and then becoming trapped if the tide comes up while we're ashore. ??? Well, what do you have? We settled on fish and he was sort of vague about the accompaniments... But we told him we would be back for lunch at 1pm. We continued on to the hardware/grocery/housewares store up the road with our jugs. The store truly did have a little bit of everything. We found drinking water but wanted to keep our jugs since they have handles. The lady at the store called a guy over to help us. He went across the street to borrow a funnel so that we could transfer the water to our jugs, then he proceeded to pour while I held the funnel. Poor Bruce, no place for me but his lap! We picked up a few things we needed and paid our way out and realized that the lady had the guy bring around a golf cart to take us and our jugs back to the dock. What awesome customer service and of course we gave him a tip. We continued on our walk around the quiet streets of town. It's relatively clean for an outer settlement. The Abacos have really been exceptionally clean as compared to the Exumas. It started to get hot. There was hardly a breath of wind in town and we were wishing for one o'clock so that we could have lunch and return to the boat for some snorkeling. We walked down to the beach so that we could cool our feet in the balmy water. We could see Dos Libras out there waiting for us. Sea grass piled two feet high! Mermaid's bed? Right now... neither do we. We found a spot to sit and just stare out... trying to absorb all of this beauty. You just can't. It's too much. We still had over an hour to lunch... just enough time to take our water jugs back to the boat and return to the restaurant. We continued up the beach and found this man cleaning fish. We took a look at what he had.. a huge brown grouper and a really big red snapper. They both looked as if they had seen better days. All thoughts of buying some fish from this guy evaporated on the wind from the wings of a hundred flies... ick. He said that he works for the Disney Cruise Ships that come to the next island over. He takes cruisers out for fishing excursions on his little boat. I was glad to hear that Disney hired locally instead of importing all of their workers. Luckily for us, those images of his fish were not our last ones of this beach. Far off rain clouds... hope they STAY far off! 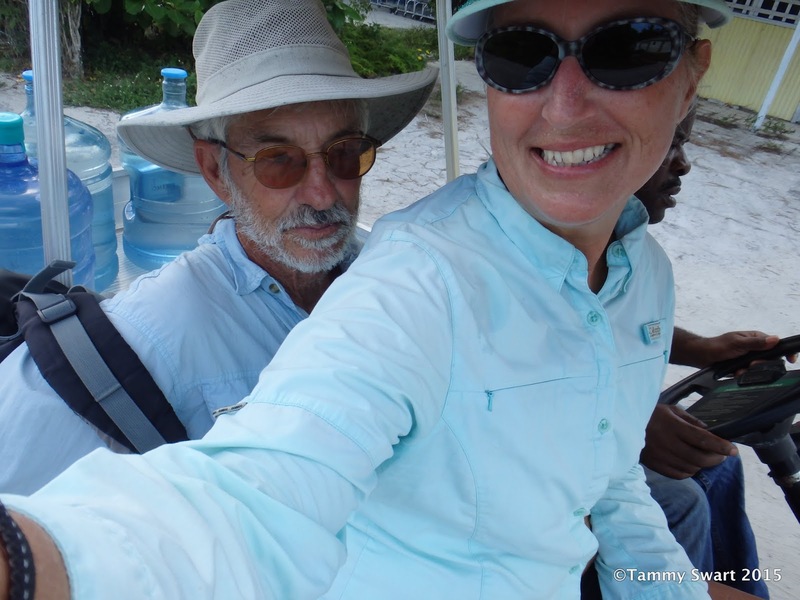 We buzzed back out to the boat and offloaded our three water jugs and returned just in time for our lunch appointment. Our parking spot was PRIMO... right in front of this very laid back eatery, Nancy's Seaside Restaurant. I'm thinking (sadly) that Nancy was the daughter whom Mr. Adley had earlier told us had died at age 28. He said she took poorly and died. I have to wonder if he will ever know what killed her... sad. Business must not be too good around here. We walked up onto the porch and realized that we were the only patrons in the place. I began to wonder if Mr. Adley had spoken out of turn when he said he owned "that restaurant over there"... maybe he does own it, but maybe it isn't really a restaurant. Maybe his other daughters (mentioned in our earlier conversation) were actually the ones who run this place and he just got caught! Oh well, we're here and we're hungry! We took our seats inside at the bar. The place was very clean and nice. Mr. Adley came out of the kitchen and saw that we were here. He came over and asked us what we wanted for lunch... really, we're doing this again. We decided on the offered fish and slaw. That would be great. Yes, that's orange juice... it's all he had. Thankfully, along with all of my worrying, I was also busily preparing myself mentally for this eventuality. I could do this. I could pick off the white morsels and find food in the wild. So I dug in. Everything was actually very flavorful and delicious. 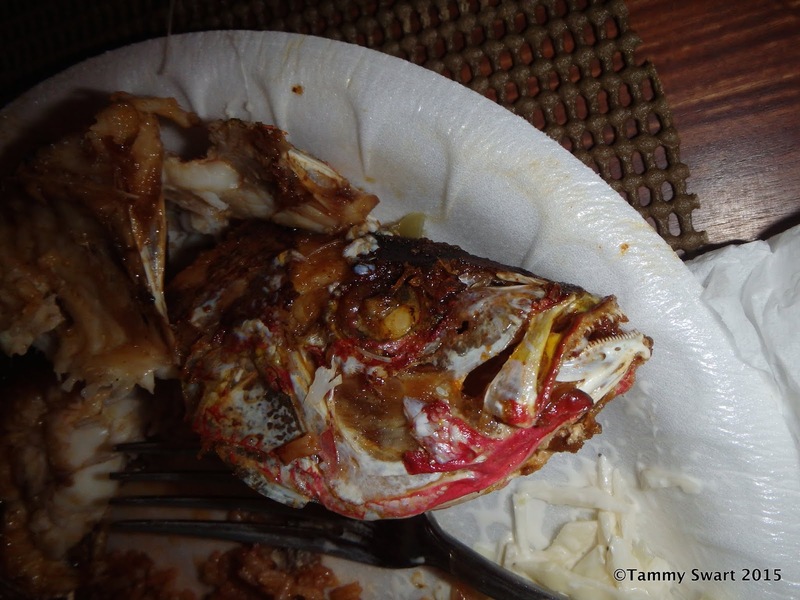 If you can overlook the skin and the bones (and the fins and they eyeballs) it was really a great lunch. It was "authentic". That's what I call it when the food was truly what the Bahamians would eat. And this is it for sure. I guess he took me at my word when I told him to just "fix whatever you were going to have for lunch". I was proud of myself for finishing nearly every bite (what didn't bite me first). We settled up and sped back to the boat for some snorkeling! We quickly changed into our suits, grabbed our fins and plunged into the water right off the back of the boat. Bruce went to work scrubbing the bottom of the boat. He just can't stop... we really do need a bottom job when we get back to Florida... it's on the list. 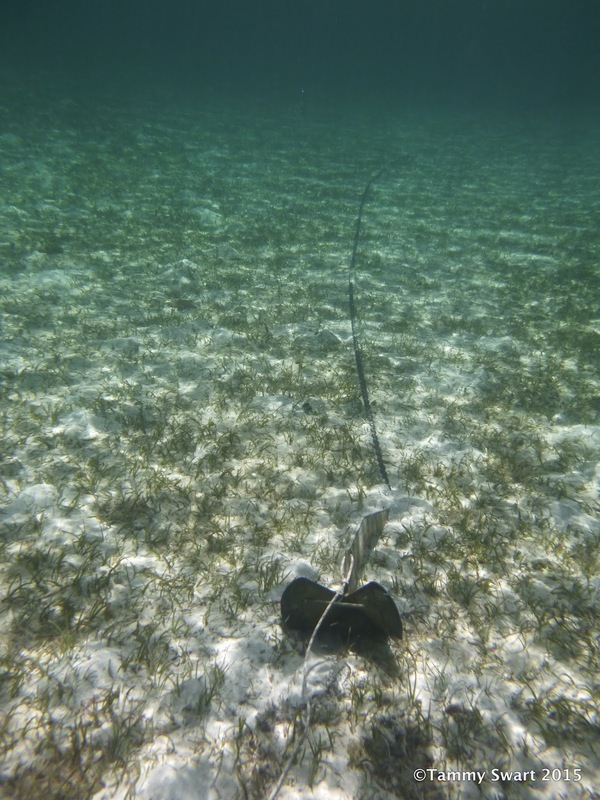 I took off to see just how many of those Bahama Stars were really down there... The answer... LOTS! He has some kind of stuff growing on him. Nice effect! Really... Lots. But just how many pictures of starfish can you stand? Well there was this one other little guy too, not as exciting as his big brothers, but cute. There wasn't a whole lot else to look at. There weren't any rocks or coral so no fish really. There were a few conch shells but I saw no sign of critters living inside... There were a lot of dead sand dollars that were perfect and white, but too deep for me to get them. I'm a wimp. One rock had some feather dusters on it. 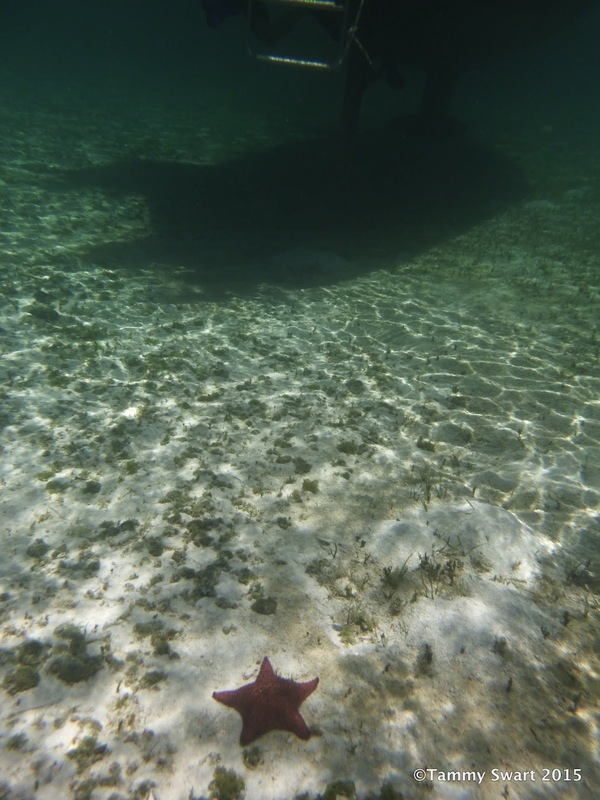 Being underwater with the boat fascinates me. I just can't quit looking at her looming in the water floating on nothing. Pretty shallow right? I swam out and checked the anchor. Some other cruisers said that there was not a lot of sand here, mostly rock. I saw a lot of that, but we were in a shallow sandy spot and with the light winds, no other boats and 25 miles to drag... we felt pretty secure. I think we will be back to Sandy Point. 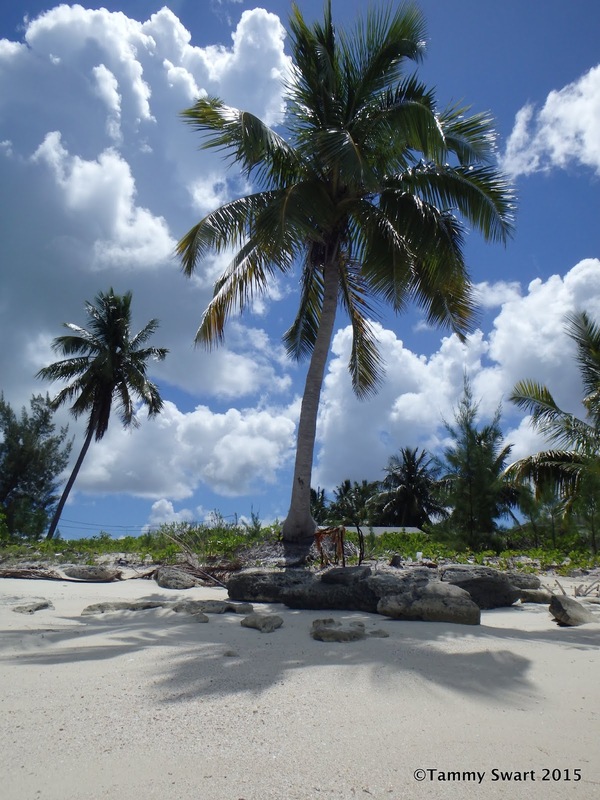 What a perfect last impression of the Abacos. Tomorrow... we're Berry Bound! You can see the starfish on the bottom! Gorgeous photos ... can't get over how clear the water is! Enjoy the Berrys ... looking forward to reading about that area too! Nice post! We have never been to Sandy Point. Maybe will try to get there someday.